It was formed between 315 MYA and 306 MYA by large scale and periodic flooding of the alluvial plain from the ancient Cobequid mountains. The rock is a polymictic (having more than one variety of pebble) conglomerate which contains marine fossils such as brachiopods even though the rock itself was not formed in a marine environment. 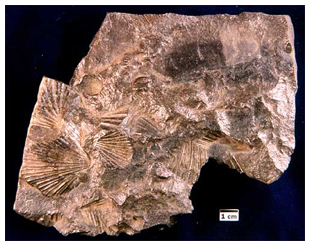 The fossils did indeed begin life in a marine environment but tectonic forces uplifted them into the Cobequid mountains there they were washed into alluvial fans. These fans reformed into Claremont conglomerate where we find them today in and around the mill site.